Native to South Asia, the herbaceous turmeric plant can be found growing wild in the region's forests. Today the spice is cultivated around the globe, from China to Peru to Sri Lanka. Add in Australia, Africa and the West Indies, and you can see turmeric spice is certainly very popular. Apart from tasting, the other way to tell them apart is the outer skin is typically darker than ginger. But if you're still not sure, slice the root and the vivid orange colour gives the game away. Whilst it's grown for food and dyeing purposes, there are numerous studies looking into the health benefits. More info on this. The turmeric plant, which grows up to a height of 3 feet (1 metre), is grown by planting pieces of the previous season's root. The plant produces large oblong leaves and yellowy white flowers which grow on a spiky stalk. 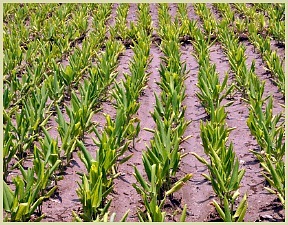 It takes about 9 months after planting before it's ready for harvesting. To do this the entire underground root system is carefully lifted out of the ground before either being used fresh, or they are boiled and then left to dry in the sun. After drying they are ground into the vivid yellow powder we're all so familiar with nowadays. ...In certain parts of Western India, food is wrapped and cooked in the leaves. Likewise in Indonesia the leaves are used in local speciality dishes like rendang and sate padang. In Malaysia the large leaves are simmered before eating, and in Thailand the young shoots are boiled before eating. Turmeric - curcuma longa - is used to add both flavour and colour to food and is nearly always used when making spice mixes, curries and is often used in rice dishes. You can even make a super healthy tea! Click for my simple recipe. As a food colouring you'll find it used in certain pickles, chutneys, yoghurts and American style mustard. More on the spice.